Why should you own Zombucks Walker rounds? Simple - it's the official currency of the apocalypse. The 2017 Zombucks Walker pays homage to the Walking Liberty Half-Dollar (1916-1947) and the American Silver Eagle (1986-2013), which depicts a beautiful image of Walking Liberty striding forward with the sun on the horizon. The original Walking Liberty is also accompanied by stars and stripes while clutching laurel and oak branches. Adolf Weinman's design grasps the essence of what the U.S. Mint was looking for during the mid-1910's, which was patriotism, independence and liberty. While there's nothing patriotic about being chased by the living dead and fighting evil to survive, it's the the reality of a zombie apocalypse. This silver Walker is a zombified Walking Liberty reaching ahead for a human. She is wrapped in torn and disheveled clothing with an ax in hand, surrounded by stars and stripes and walking in front of a mushroom cloud. Each Zombucks Walker is composed of 1 oz of .999 fine silver. Along with the zombified Liberty, the inscriptions read "WALKER," "2017" and the denomination of "Z50." The heart of the reverse is a biohazard symbol to remind humans of the hazards of the apocalypse. It is inscribed with "ZOMBUCKS," "1 oz .999 FINE SILVER" and "CURRENCY OF THE APOCALYPSE," along with a Provident Metals compass logo. Provident Mint began producing Zombucks limited mintage rounds to document the zombie period. In total, we will release 10 Zombucks rounds that pay tribute to historic coins or figures, with all 10 being offered in copper and silver. Weinman's Walking Liberty design is said to be among the most beautiful U.S. coins ever designed. 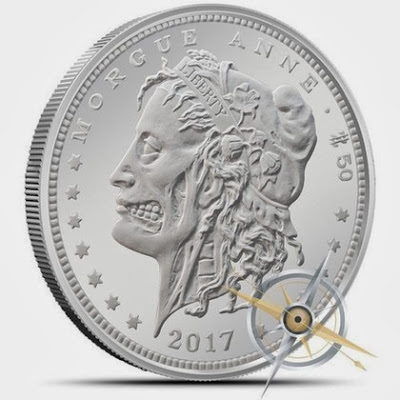 The Zombucks Walker celebrates that popular coin, but the zombified Walking Liberty is beautiful in its own right. And if this is the last time you ever have an online connection, stay safe and never give up!